WARSHIP plans by the Royal Navy will not be altered due to Brexit, a defence minister has said. Earl Howe said the government was ‘committed’ to a surface fleet of 19 frigates and destroyers for the Royal Navy. 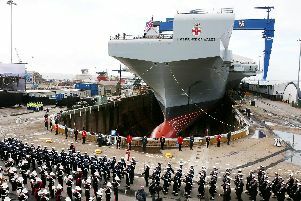 However, the Tory lord did not suggest the Senior Service would get extra warships on top of this. His comments come amid uncertainty over Brexit and concerns about whether Brtain’s navy had enough vessels to carry out global deployments while defending the seas around the UK. Admiral Lord Alan West, a former head of the navy, asked what ‘assessment’ the government had made of ‘how many destroyer and frigate vessels will be required to meet the UK broad strategic defence goals after Brexit’. Responding Earl Howe told the Labour peer the navy’s six Type 45 destroyers were ‘hugely capable’ and would continue to serve the UK. He added the first batch of the nation’s new budget frigate, the Type 31e in 2023, with ‘five ships delivered by the end of 2028’.